LepideAuditor for Active Directory helps the administrator track and control changes made in Active Directory objects. It provides every detail of any change such as, who changed what, when and from where. Software generates real time alerts through email on any critical changes made to the AD. It helps the admin identify and restore to avoid major damage to Active Directory. Software also helps to keep AD environment secure and uphold various compliances i.e. HIPAA, PCI, SOX, GLBA and ITIL. LepideAuditor for Active Directory’s AD change control features lets the administrator restore selected changes or restore AD to a previous stable state. The application takes periodic snapshots of various states of Active Directory and any of these snapshots can be used to restore AD to the required state. Moreover, it also provides the facility to generate reports on structural changes made in AD and schedule reports to get periodic updates on AD changes. NetWrix Active Directory Change Reporter tracks and reports changes made to Active Directory, Exchange and Group Policy in a way that built-in auditing devices cannot. By providing administrators with reports detailing the “who, what, when and where”, including all before and after values of all Active Directory changes, Active Directory Change Reporter is a valuable auditing tool that can be used for daily activity reviews and regular compliance audits. ChangeAuditor tracks your critical Active Directory, File Server, and Exchange configuration changes. ChangeAuditor helps you to understand exactly what type of change occurred and the most critical details about each change. 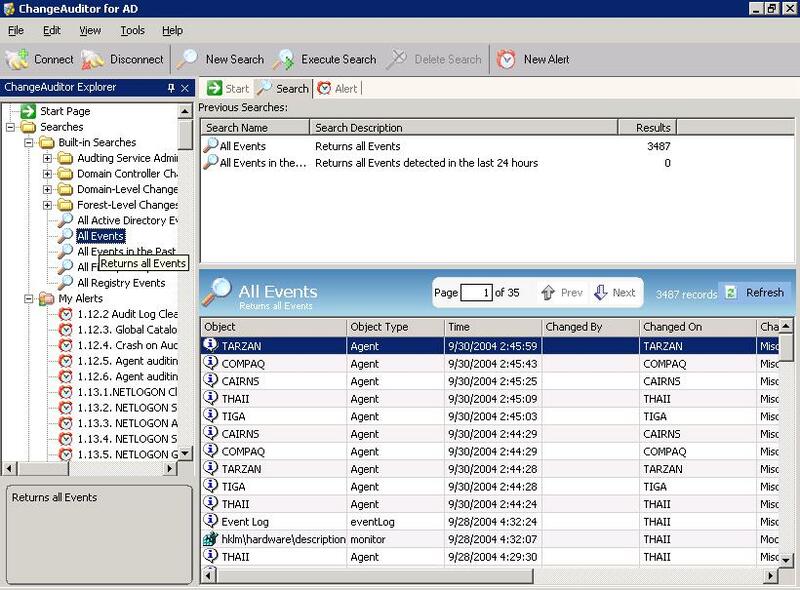 ChangeAuditor identifies changes (OUs, Users, Computers, Groups, GPO, Domains and DNS) as they occur and provides the "5 Ws" for each change. Who made the change, What the change was, including new and previous values, When the change was made, Where the change was made, Why the change was made.